Lets talk about granola! My relationship with granola (and müsli) goes way back. 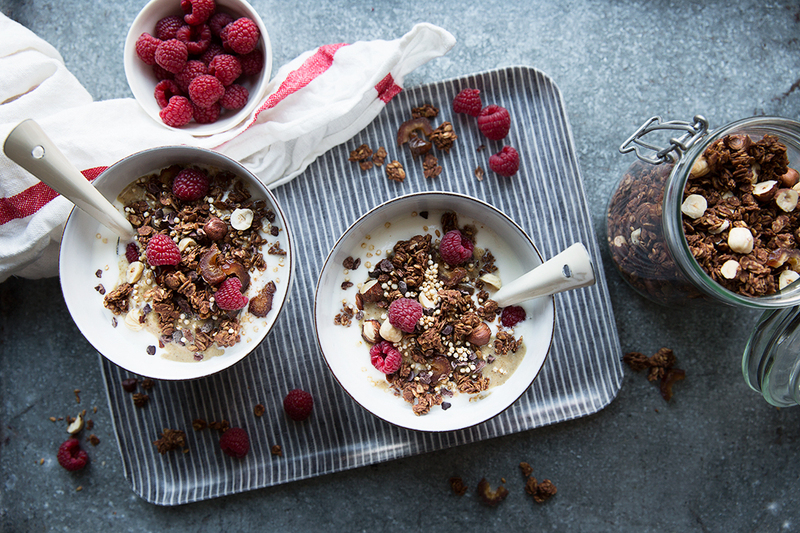 We always had my mum’s homemade granola or müsli in the pantry when I was a kid, and even if I didn’t always appreciate it back then (as a teenager I was a sucker for store bought foods – probably because we had mainly homemade stuff! ), the love for granola has grown ever since. And at the age of 43 I have tried enough recipes and methods to figure out how I like my granola best. Slow roasted. Have you tried slow roasting your granola? Slow roasting means roasting on low temperature (approx. between 85° C – 120° C) for a longer time. Since I tried slow roasting the first time a few years ago, I will never go back to temperatures over 120° C. Slow roasting is in my opinion the way to get perfectly crunchy granola every time. It does take a few hours, but since the temperature is so low you can easily leave the house for an hour or so, or simply focus on other things around the house, and the granola won’t burn. Making your own granola is both fun, simple and gives you the power to decide exactly what’s in it. And once it is made and sits in a jar on your kitchen counter it becomes your best breakfast friend (ok, sometimes lunch and evening snack too) for the next week or so. 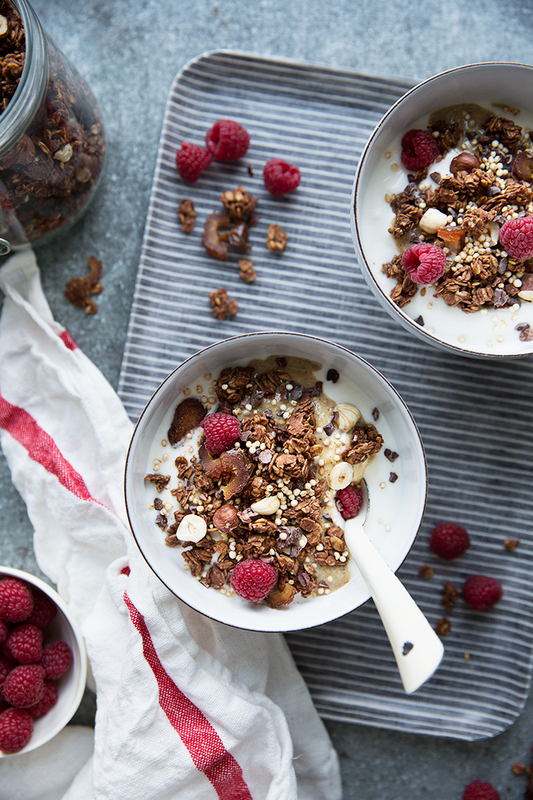 There are a few more recipes for slow roasted granola here on the blog (try this or this), but in this blog post I’ve put together two of my personal favorites (Basic and Grain Free granola) along with a brand new recipe for a super delicious Chocolate Olive Oil Granola. And, don’t miss out on my Instagram Granola Party #lovegranolaparty where I will repost the best images of your granola meals! Read more here! Enjoy! And please share in the comments (or on Instagram) if you have a personal favorite granola recipe! This recipe is super simple. A basic granola to which you can add your own dried fruit, nuts, seeds or fresh berries if you like. This means that everyone in a family can create the breakfast they like using the same granola base. 1) Preheat the oven to 95° C (200° F) and line a baking tray with parchment paper. 2) Mix oats and buckwheat flour in a large bowl. In another bowl whisk together coconut oil, maple syrup, water, sea salt and powdered vanilla. 3) Combine all ingredients and mix well with carefully washed hands or a wooden spoon to coat everything. Squeeze the grains a little between your fingers to get a more clustered result. 4) Spread the granola mixture out evenly over the baking tray. Pop into the oven and roast for about 3,5-4 hours. On this low temperature you don’t even have to stir during roasting – and you will get perfectly roasted and clustered granola without burning. But do check after an hour or two the first time you make it, since the temperature in your oven may vary slightly from the oven I use. 5) Switch off the heat and leave the baking tray in the oven to dry completely while the oven cools. 6) When completely cool, store in an airtight jar for up to a month. SERVING SUGGESTION: Raspberry Chia pudding, Greek yoghurt, almond butter and granola + fresh fruits/berries on top. 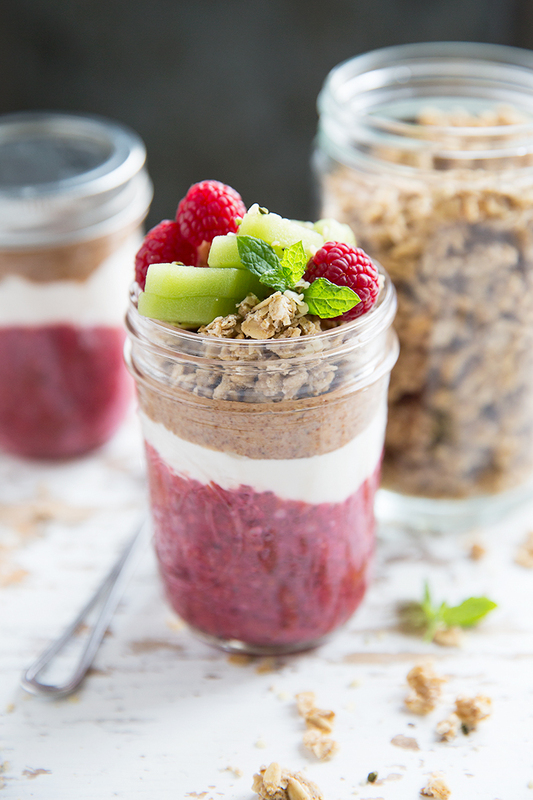 This can also be made in a jar for on-the-go breakfasts or snacks. When you put the granola on top of the almond butter it will stay crunchy and dry for up to 24 hours. Bring the fruits or berries in a separate jar. 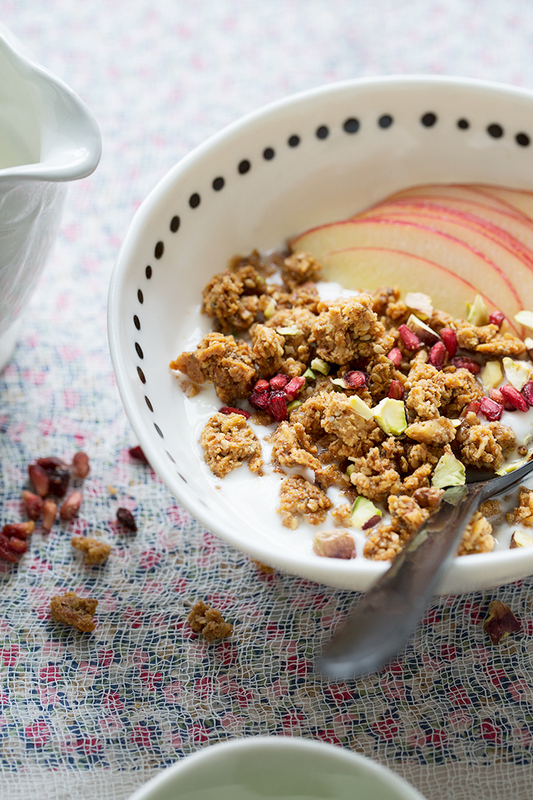 This brand new recipe is a twist on the Basic granola recipe. My husband was hesitant at first, but not after he tried his first bowl of yoghurt topped with it… It is also super delicious with homemade tahini – a must try! 2) Mix oats, brown rice flour and flaxseeds in a large bowl. In another bowl whisk together olive oil, date- and maple syrup, water, cacao powder, sea salt and vanilla. 4) Spread the granola mixture out evenly over the baking tray. Pop into the oven and roast for about 2,5 hours. Add the hazelnuts and roast for 1 more hour. 6) When completely cool, add the dates and store in an airtight jar for up to a month. SERVING SUGGESTION: Unsweetened yoghurt, tahini (so delicious! ), cacao nibs, puffed quinoa and fresh berries. A super delicious gluten free and grain free granola, made entirely from nuts/almonds and seeds. A must try! 1) Soak walnuts, almonds and cashew nuts in water with a pinch of salt overnight or for at least 6 hours. Soaking the nuts first removes the enzyme inhibitors, making them easier to digest. 2) Preheat the oven to 95° C (200° F). Drain and rinse the nuts and wipe excess water off using a clean tea towel. 3) Place the nuts in the bowl of a food processor or stand mixer and pulse until just coarsely chopped. If using a stand mixer you might need to help a little by scraping the nuts down the sides a few times. 4) In a sauce pan over low heat melt together maple syrup, coconut oil and sea salt stirring continually to combine. Add vanilla, cardamom and cinnamon and whisk until well combined. 5) Add the maple syrup mixture to the nuts in the food processor and pulse to combine. 6) Add shredded coconut, chia seeds and sesame seeds to the bowl and pulse again until well mixed. 7) Spread the granola mixture out evenly on a parchment paper on a baking tray and bake for about 4 hours – or until dry, crispy and golden in color. 8) Let the granola cool on the baking tray or leave it in the oven when turned off to dry completely. 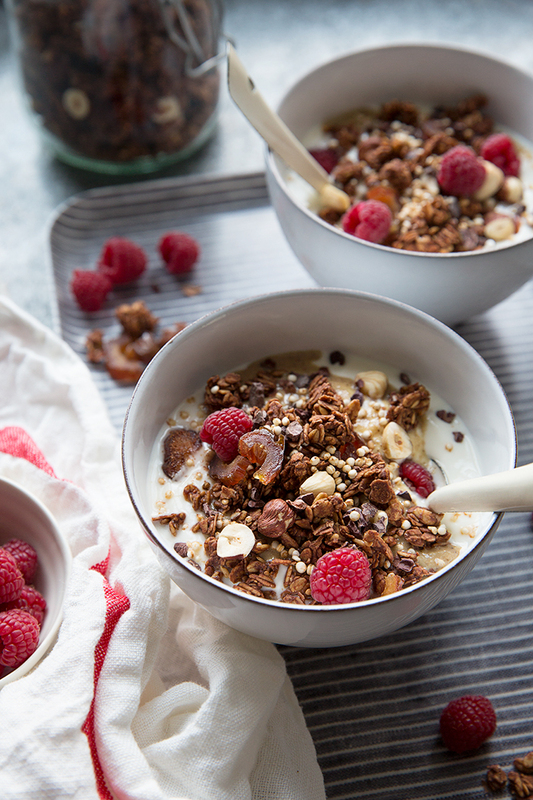 Your granola looks delicious and so pretty. Also, would the recipe wtill work if i bake it at normal temperature, for a shorter time? Your blog is beautfiul and inspiring, keep uo the great work! Thank you Emilye! You can use any flour – even wheat or rye for example – but it works perfectly to just omit the flour too. It makes an even crunchier granola… :-) Of course – you can bake it for shorter time on higher temperature. Just make sure it doesn’t burn!